Henry the Eighth was married to a Spanish princess called Catherine of Aragon, but only had one daughter (Mary) in 18 years of marriage. Henry wanted to divorce Catherine so that he could have a son, but the Pope refused to allow this. He therefore created a separate Church which did not regard the Pope as its leader, although Henry still supported Catholic beliefs . 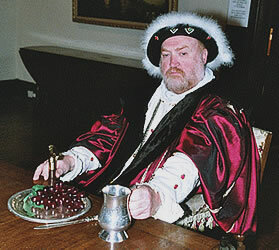 He married Anne Boleyn, but she produced another daughter (Elizabeth). He accused her of having a love affair and she was killed (beheaded). He married Jane Seymour and had a son (Edward), but she died. He married a German princess called Anne of Cleaves, but didn't like her and had the marriage cancelled. Next he married Catherine Howard, but she had a love affair and was killed (beheaded). 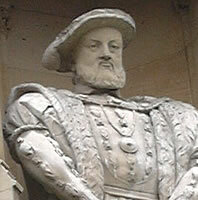 His sixth wife Catherine Parr managed to live longer than Henry. English schoolchildren remember what happened to the six wives by remembering the sentence: "Divorced, beheaded, died; divorced, beheaded, survived". Wales was united with England at this time. 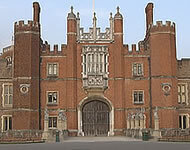 Henry the Eighth spent a lot of money on creating a palace near London at Hampton Court, which can still be visited today (see: http://www.hrp.org.uk). Tudor houses can still be seen in several parts of the country, including in Chester. The Reformation took place in Europe at this time. Starting in Germany under Martin Luther, the Protestant Church grew quickly and became established in half of Europe. After Henry the Eighth died and Edward the Sixth became king, the Protestant faith began to become established in England. A Book of Common Prayer (written in English) was introduced in chuches in about 1550, and priests were allowed to marry. However, when Edward died, Mary the First became Queen and tried to convert the country back to the Catholic Church, killing many people who refused: for this reason she is often known as Bloody Mary. She was married to the Spanish King Philip the Second. 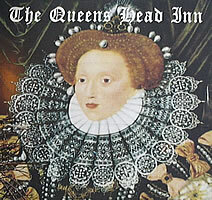 Elizabeth the First became queen after Mary died. She restored the Protestant religion and the Church of England became established. Philip the Second of Spain sent a fleet of ships, known as the Spanish Armada, to be used for an invasion of England, but this was defeated. 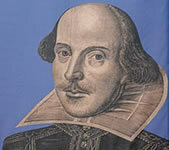 William Shakespeare wrote plays and poetry at this time. The Globe Theatre in London, a copy of which has recently been built, was a popular place to watch plays (see: http://www.shakespeares-globe.org). Sir Francis Drake travelled around the world in a ship called the Golden Hinde, as well as helping to defeat the Spanish Armada. Sir Walter Raleigh went to America and established a new colony there called Virginia (named after Elizabeth, who was called the Virgin Queen because she never married): he also brought potatoes and tobacco to England for the first time.